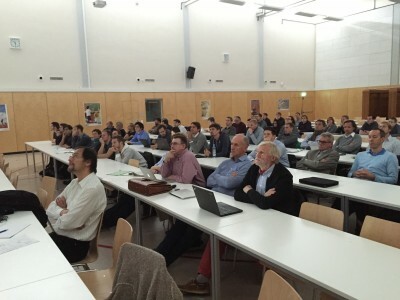 On 27th and 28th of October 2015 the 7th ROBEX community workshop was held at the University of Würzburg with a total of 65 participants from the 16 partner institutions. 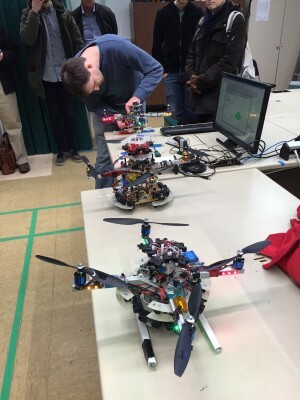 The workshop started with a visit to the experimental facilities of the Würzburg colleagues led by Professor Sergio Montenegro (Institute for Information Technology Aerospace) and demonstrations of (autonomous) helicopter navigation and small satellite operations with more autonomy. The rest of the first day was held under the heading „update” about the progress made in the four topics „science“, „infrastructure“,“robotics“ and „instruments „, and within the 12 design teams. The second day was more future-oriented, on the one hand the plan for the two demonstration missions was presented, on the other hand, there were a series of guest lectures, which showed the variety of starting points for a future networking of Robex with additional partners. Regarding the demonstration mission „Moon Analog“ was reported that scientists after evaluation of the data obtained during a scouting trip have decided to perform in the first step classic seismic surveys on the island of Vulcano and on Etna in 2016. In 2017 the demonsstration mission “Moon-Analogue” will show that autonomous robotic measurements with the seismometer can be performed in the test area on Etna. The plans for the demonstration mission deep sea are also promising, as the application for the research vessel “Polarstern” has been approved for a timeslot of 3 weeks from end of July to beginning of August for around 50 people. The guest lectures covered a wide range: So presented William Kirkwood from the Monterey Bay Aquarium Research Institute „Fault-tolerant actuator system for Dorado class autonomous underwater vehicles AUVs,“ Dr. Boris Behncke from the italian National Institute of Geophysics and Volcanology INGV talked about a variety of methods of monitoring the Etna volcano activities, Dr. Jean-Pierre de Vera from the DLR Institute of Planetary Research presented the current project BIOMEX, and also the project application BioSign with involvement of some members of ROBEX, Prof. Peter Höher from the University of Kiel talked about the work of the „Kieler AUV Alliance“ and Prof. Ralph Lorenz (John Hopkins University Washington) gave a presentation about plans for a submarine to explore methane lakes on Saturn’s moon Titan. This workshop offered again the opportunity to intensify the internal network within ROBEX but also further promotion of the spirit of ROBEX to national , european and international institutions in order to prepare for sustainability of ROBEX. 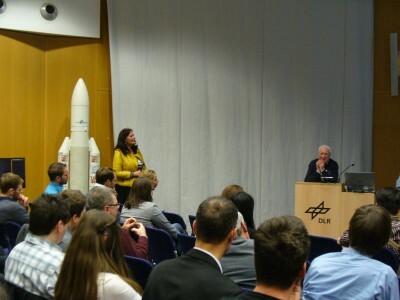 On the 11th / 12th March 2015 the Robex community met with experts from space and deep-sea research for the 6th time in a large group to present again new results and progress in the project. One focus of this workshop, which took place at the DLR Institute of Planetary Research in Berlin was the conceptual design of the ROBEX midterm evaluation in April 2015. 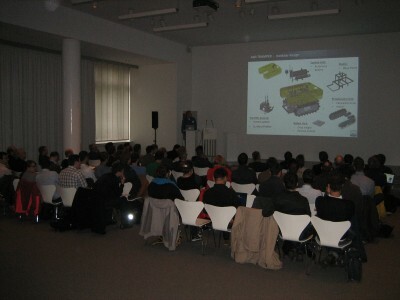 The 5th ROBEX Community Workshop took place from 14th to 16th of October at the Kunsthalle in Kiel. In addition to about 70 ROBEX employees also the ROBEX Advisory Board was represented by two experts from space and deep-sea research that has commented the progress of ROBEX after almost 2 years. We have thus obtained valuable suggestions for the upcoming interim evaluation in spring 2015. Overall, it was once again a successful and felicitous coincidence of the ROBEX Community with presentations of current results and activities. At this point, a thank you to the GEOMAR and the colleagues of the organizing team who have contributed to the success of the workshop. More information can be found in the press release from GEOMAR. 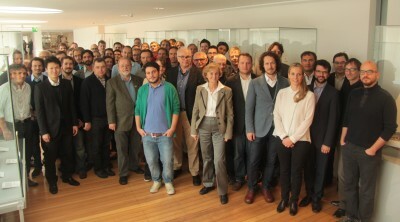 @ AWI, C. Kanzog | 5th ROBEX Community Workshop at the Kunsthalle Kiel. 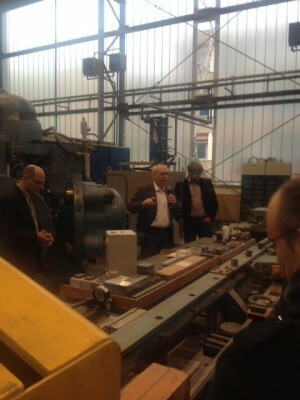 @ AWI, C. Kanzog | Visit of Technology and Logistics Centre at Geomar. On 16th of September 2014 the new robotic lab was opened at Airbus Defence and Space. 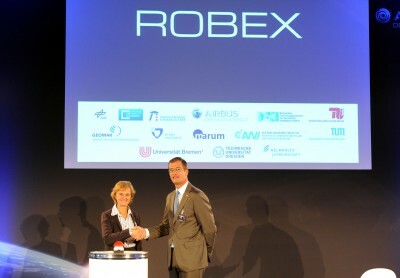 During this event, the cooperation agreement on the inclusion of Airbus DS as an associate partner in the HGF Alliance ROBEX was signed by Prof. Karin Lochte (AWI) and Mr Bart Rynan (Airbus DS). The ROBEX consortium came together in a grant scale for the fourth time from 17th to 19th of March 2014. 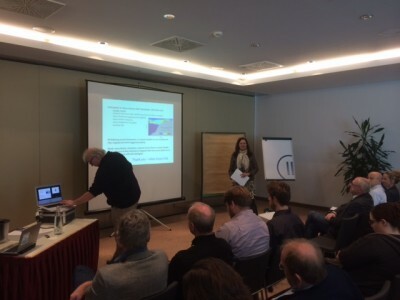 The 4th community workshop was held in Dresden and offered again a good opportunity to exchange information regarding the current ROBEX activities and to jointly discuss how to proceed in future. 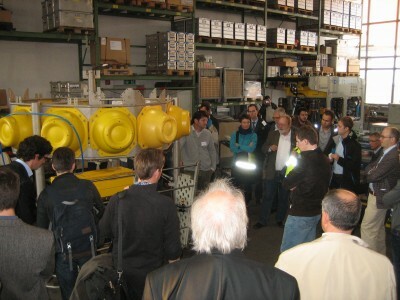 In addition to a prototype of an underwater pressure housing made ​​of concrete we visited the workplaces of our ROBEX partner TU Dresden and received interesting insights into their work. In this workshop, there was a time overlap with the training workshop (19/20 March 2014) that particularly dedicated the promotion of ROBEX PhD students and thus combined young scientists with experienced experts from both scientific fields. At the beginnig of 2014 the DLR Space Administration has started an initiative to promote innovation and new markets – the INNOspace initiative. This initiative includes professional meetings, expert workshops and ideas competitions. The focus is on the development of new markets and the transfer of space technologies. An important pillar of the DLR INNOspace initiative is the implementation of cross-industry trade conferences. These symposia bring together the space industry with one to two other sectors and identify synergies or transfer opportunities. The symposia will be carried out in close cooperation with the federal states and the BMWi. For the 20th February 2014 is scheduled a conference for space and maritime industry in Bremen. More information can be found here. The third Community Workshop took place at the German Maritime Museum (DSM) in Bremerhaven. Representatives from the various partner institutes and work packages came together and presented their outcomes of research collaborations within the preparatory phase (first project year). The ROBEX Advisory Board, composed of international experts from space and deep-sea science, first came together during this workshop. The main objective was to learn more about the ROBEX Alliance and to inform the ROBEX community about their impressions and recommendations to e successful implementation of ROBEX. 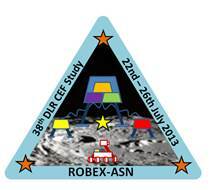 The Concurrent Engineering (CE) Study ROBEX-ASN (Active Seismic Network) took place from 22nd to 26th of July 2013 at the DLR Institute of Space Systems in Bremen. The study consisted of the system design in phase A of a mission that shall establish an active seismic experiment on the surface of the Moon, with the objective of giving insights into its internal structure and composition. 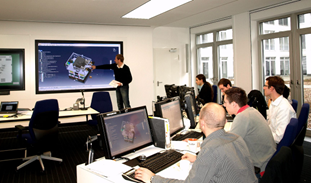 Around 20 space engineers and scientists of the Helmholtz Association worked on a modular lunar architecture during five intensive days in the DLR’s Concurrent Engineering Facility (CEF), where team work, expertize sharing and group discussions had the most significant role. Topic leader and representatives from various work packages summarized the outcome of the first 6 month of ROBEX and further developed plans for the ROBEX project demo missions and research collaborations. 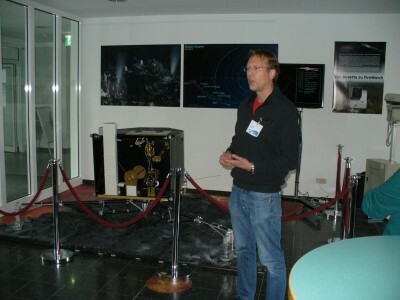 25 early career scientists and technicians from the fields of lunar, space and ocean research met together at the German Aerospace Center in Oberpfaffenhofen for an interdisciplinary Training Workshop. The focus was on an exchange of expertise and joint development of various scientific scenarios for both research fields.